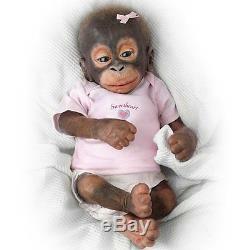 Exclusive Collectible Orangutan Baby Doll an Amazing So Truly Real(R) First! Lovable Monkey Doll by Artist Wendy Dickison! 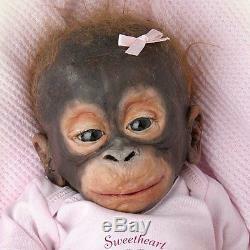 - Fall in love with Little Umi, a collectible orangutan baby doll you have to see to believe, and the first-ever So Truly Real(R) baby monkey doll! Beautifully crafted, her head and limbs are of collector-quality silicone that recreate every realistic detail of her face, hands and feet. Hand-rooted wispy red hair covers her from head to toe. Offer Little Umi her FREE pacifier and watch as she gazes up at you with gentle, trusting eyes. This irresistible collectible monkey doll by renowned doll artist Wendy Dickison is available exclusively from The Ashton-Drake Galleries. Don't wait to let your love for Little Umi nurture the miracle of birth and life across our beautiful world. Strong demand is expected, so order now! 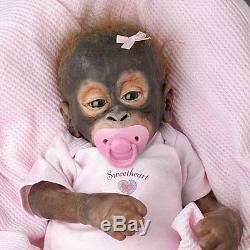 This incredible collectible orangutan baby doll is perfect in every detail, with head and limbs crafted of collector-quality silicone that recreates every realistic detail of her face, hands and feet. You'll be entranced by Little Umi's gentle eyes, thick dark lashes and her all-over wispy red hair, meticulously rooted by hand for a totally natural look. Little Umi arrives dressed in an adorable pink baby outfit with a heart detail and the word "Sweetheart" on the front. Measures 14 L; 35.6 cm L. New, never been out of the box. The item "Little Umi Orangutan Doll Collectible Monkey Doll by Ashton Drake" is in sale since Wednesday, January 31, 2018. This item is in the category "Dolls & Bears\Dolls\By Brand, Company, Character\Ashton Drake\So Truly Real". The seller is "ger-dolls" and is located in Chatsworth, Georgia.